Two hot resorts have hit the scene in Puerto Vallarta — Now Amber Puerto Vallarta (for all ages) and Secrets Vallarta Bay (for adults only). Opening April 1, these two brand new AM Resorts are located on Banderas Bay, close to downtown Puerto Vallarta and only 15 minutes from the airport. 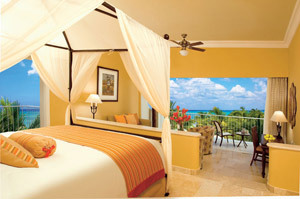 Now Amber is an upscale resort perfect for families, singles, and couples. Secrets Vallarta Bay is an upscale-luxury all-suites resort for adults only. Both resorts offer reservation-free dining, exceptional service, and beautiful rooms. I am especially excited to see a new adults only all-inclusive in Puerto Vallarta, since the options up to this point have been limited. I will update the blog with a review at some point when I’ve been able to personally inspect these resorts. But for now, consider both resorts for your next beach vacation! Now Amber Vallarta Bay Resort: 327 oceanfront suites – three pools – four a la carte restaurants, one buffet and one cafe – 24 hour room service – kids club – pool and beach wait service – Spa by Pevonia – golf range – fitness center – land and water activities – preferred club available. Secrets Vallarta Bay: 271 oceanfront suites – three pools – four a la carte restaurants, one buffet and one cafe – 24 hour room service – pool and beach wait service – Secrets Spa by Pevonia – fitness center – pool and beach wait service – preferred club available. Happy travels ~ Cindy Grant, Travel Consultant. Reconnect Travel/Expert Family Travel. Dallas-Fort Worth metro area (serving clients nationwide). 972-625-6200. ~Happy Travels, Cindy Grant, Reconnect Travel/Expert Family Travel 972-625-6200. Travel agency located in the DFW area near Frisco, Plano, Carrollton, Little Elm, The Colony, Lewisville, Irving Texas. Fancy a camel ride on the beach? No problem. Beginning January (2011), Cabo Adventures has been offering the Outback and Camel Safari Tour. This popular and unique four hour tour gives you a beachside camel ride along the coast of San Cristobal, along with a hike in the desert. At the end, you get a yummy Mexican lunch and tequila tasting. I’ve had a couple of clients who signed up for this experience, and they’ve come back saying it was the highlight of their trip! And see, you don’t have to go all the way to Morocco to get that coastline camel ride, after all! The Outback & Camel Safari Tour can be added to your Cabo package, or booked directly at Cabo Adventures. Cost is approximately $99. ~Happy Travels, Cindy Grant, Travel Consultant at Reconnect Travel.com DFW metro area 972-625-6200. This resort only gets better. If you haven’t been to this resort in a while, you’re in for a treat. A new lobby and entrance, new accommodations section, an expanded spa, a new conference center, and a free form second pool – in one word, wow! Now, with all this expansion, the one thing this property has is sprawl. So if you have mobility issues, this isn’t the resort for you. But this is a great resort for families, couples, and singles traveling together. It’s also a great property for family reunions, since it has a little bit of something for everyone. This resort has perfected the destination wedding venue, and manages to offer up to 4 weddings a day smoothly and flawlessly. Select from beach, chapel, and garden locations. But book your destination wedding early, because the’s word’s gotten out! I was happy to see their newly expanded spa. 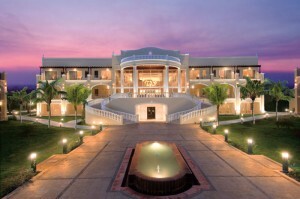 This brings this spa in line with Secrets’ sister properties, and is also managed by Pevonia. Spa prices are higher than I pay for in Dallas, but it’s about that pampering splurge. There’s a wide range of room categories here. The least expensive Deluxe Garden View Rooms are in the older part of the resort, with hacienda-style courtyards. They are beautiful rooms, but pale in comparison to the Junior Suites so if you can afford the upgrade, it’s well worth it. The property sits just north of the Tulum ruins, but the foliage has grown to the point that the Tulum ruins are hard to (if not impossible) to see. Still, take a stroll along the beach going south, and you’re bound to see them. And speaking of strolls, the beach here continues to be GORGEOUS! Bottom line: this resort continues to shine. Elegant. Adults only. Exceptional beach. Oversized rooms. Fantastic food. No wonder everyone looks happy at Secrets Maroma Beach, a luxury resort situated on the beautiful Maroma Beach near Playa del Carmen, Mexico. This resort evokes images of Morocco-meets-Mexico. And did I mention everyone here is happy? The guests on the beach, in the pool, in the lobby — the joy here is infectious. Plus, the staff is awfully chirpy too. This is an adults only resort, but it’s a nice mix of young and old, couples and honeymooners, and adult friends who enjoy traveling together as a group. Most rooms here are over-sized Junior Suites with king sized, four poster beds. There are a few rooms with two double beds in the rooms, and mattresses are “just-right” pillow top. 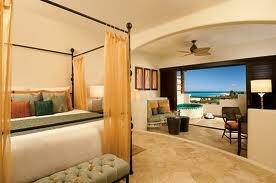 Upgraded rooms include honeymoon and Presidential suites. And you can upgrade to the Preferred Club to get free in-room internet access and entry to the Preferred Lounge where you find a bar with top shelf labels, a pillow menu, concierge services, and continental breakfast and hors d oeuvres served during the day. The Swim-out Junior Suites step into a river pool. There are seven restaurants, a grill, a cafe, and 24 hour room service. Six bars are scattered throughout the property, including a swim-up bar in the pool (a requirement for some of my clients!) Plus for you Starbucks-addicts, enjoy a delicious coffee beverage from CoCo Cafe. All meals and drinks are included in your stay, with the exception of wine by the bottle. One step into the spa, and you’ll say “ahhhh.” The sensuous fragrance of passion fruit and the beauty of this 13,000 square foot spa will surely get you to a happy place. Spa prices are MORE than what I’m used to paying in Dallas, but it’s certainly worth the treat. It’s no wonder that this resort frequently sells out, so book early to avoid disappointment. It’s a great resort choice for a destination wedding, but then again you’ll want to book early! Destination weddings have become an acceptable and popular option for nuptuals, and the sophistication, options, and venues only increase every year. 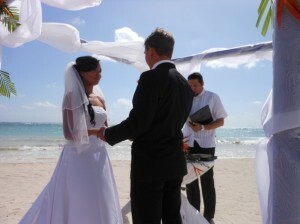 And while the beach ceremony is still hot, other locations such as gardens, gazebos, waterfalls, rainforests, and beachfront chapels are possibilities. Good news is that you don’t have to trade in your spouse for the wedding of your dreams. Renew your vows instead! You can renew vows for a ceremony, just the two of you. Or, include your friends and family for a wonderful twist on the vacation reunion. Guanacaste on Costa Rica’s Pacific Coast has been growing with 4 and 5 star resorts in the last few years, and flights have increased into the area’s airport (Liberia). The result is a nice selection of upscale and luxury beachfront resorts offering wonderful on-site amenities and activities combined with offsite excursions into Costa Rica’s rainforests, waterways, and volcanoes. Now, while resorts are sprouting up, the road conditions in Costa Rica continue to be…well, annoying. So I don’t recommend renting a car in Costa Rica (unless you’re the kind that thinks driving in Rome is a slice of pie). Good news, though, is that you don’t need a car to enjoy Costa Rica. Airport transfers are easy to book with your package, as are day excurions that include hotel pickup and drop off. One thing I will mention about Costa Rica, is that the beaches here are the rocky Pacific Ocean variety. If you’re dreaming about a white Caribbean beach, this won’t cut it. Looking for a long weekend escape to recharge your batteries? 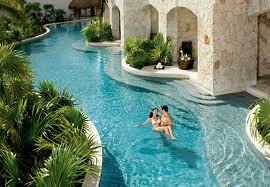 I can recommend the El Dorado Royale Spa Resort in Mexico’s Riviera Maya for your next break. As an adults-only resort, you’ll find a peaceful, laid back setting. No screaming kids in the pool, no social director toting a bullhorn. It’s a wonderful resort choice for a couple on a romantic retreat, or for girlfriends on a spa getaway. Relax in a palapa beach bed with your favorite novel, while enjoying the cool Caribbean breeze and a frosty drink concoction. How does that sound to you? In-suite Jacuzzis, pillow top mattresses, and 24 hour room service comes standard with all accommodations. This resort has been rated as one of Conde Nast Traveler’s Top 100 Hotels in the World. For an upgrade consider the swim-up junior suites which steps from the patio into the lazy river, or the Casita Suite with a private outdoor shower and hacienda-style expanded room design. Dining here is about the best you’ll find in an all-inclusive resort, with no buffet lines in sight. So go ahead and linger over dinner, the menu is creative and the service is proficient. Try sushi and Pacific Rim delights at Kampai, or perhaps fondue at LaFondue. Or for an intimate setting you can enjoy a beachfront candlelight dinner (at additional charge). The 20,000 sq. ft. Casitas Spa and the Spa Royale offer an extensive selection of treatments, saunas and steam rooms. Non-motorized water sports such as kayaks, snorkel gear, and paddle boats are included at no charge. Other water sports are available for a fee, including scuba, deep sea fishing, and wave runners. 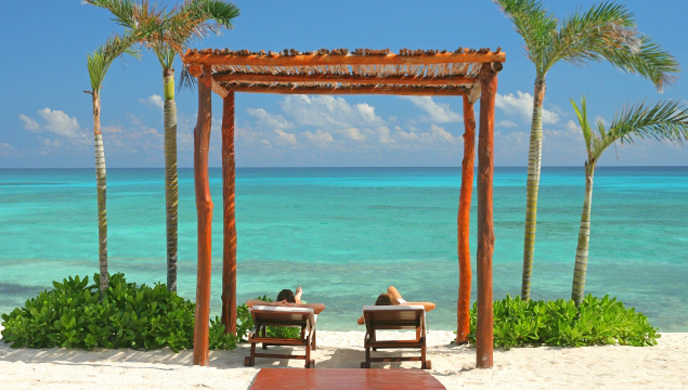 Dallas residents consider Cancun and Riviera Maya to be their “local” beaches. With flight times of around two hours and the resort location 20 minutes from the airport it’s an easy trip for a three night getaway. Meals, snacks, room service, beverages, and non-motorized water sports are included. Spa treatments and offsite tours are additional cost. Property features 664 units in 10 categories. 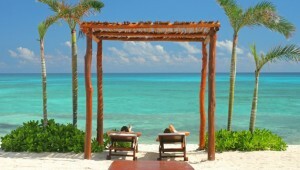 Located on the Yucatan Peninsula, Riviera Maya sits on Mexico’s Caribbean coast just south of Cancun. This resort area has been growing rapidly in the last decade and has become on of Dallas’ favorite beach destinations. The resort area spans along 60 miles of beautiful white sandy beach, where jungle meets the azure blue sea. There are resorts here to fit most budgets and expectations. There are adult-only resorts that appeal to the honeymoon and anniversary clientelle, as well as those that are family friendly. Most the resorts in the area are all-inclusive, which means that your meals, snacks, and beverages as well as some activities at the resort are included as part of your resort stay. This makes for a very convenient and hassle-free vacation. Sand, sea and unlimited frozen drinks. How can you beat that? Riviera Maya resorts are more laid back than those in Cancun’s Hotel Zone. 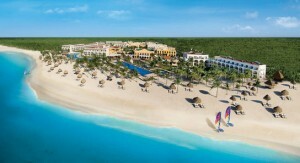 In Riviera Maya the resorts are sitting on acres, compared to the resorts in the Hotel Zone sitting on lots. Plus these resorts have plenty of activities and entertainment to keep you busy. If you decide to wander, downtown Playa del Carmen is an easy taxi ride, and offers some shopping and a bit of nightlife to boot. For daytime fun, head over to the archaeological-natural park named Xcaret. The highlight activity here is tubing down an underground river (called a cenote). The caves are awesome, and the water is refreshingly cold! Allow extra time to wander the park. For the active client, there are several golf courses in the Riviera Maya area, with reasonable green fees. Stay onsite at the Iberostar Paraiso Resort complex or the Moon Palace Resort if you’d like to focus on golf. Scuba and snorkeling in the Riviera Maya area is exceptional. Consider snorkeling from your resort, or sign up for a boat excursion for snorkeling or diving on the Great Meso-American Barrier Reef. Getting to Riviera Maya from Dallas is a snap. The flight from Dallas to Cancun is only about 2 1/2 hours, and American and Sun Country offer several nonstop flight options daily. Book your package with transfers already included, which will save from the extra hassle and cost of a taxi ride. From the airport, your resort is ten minutes to eighty minutes’ drive south. And don’t forget, air travel to Mexico requires a passport.